The following information covers the My Profile section of the Account menu. Click Account in the user menu on the top left of the page. Under Account, click My Profile. To edit the profile, click next to Account Info. 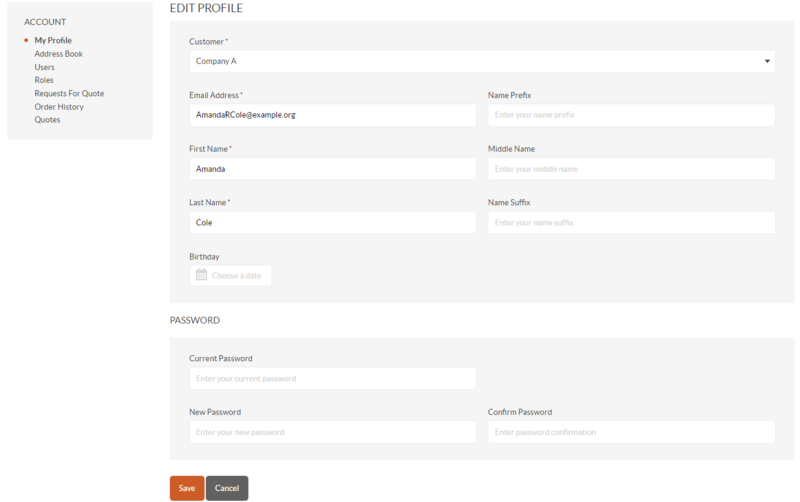 Please note that the ability to edit your account information depends on the permissions that correspond to your role. These are defined by the administrator. 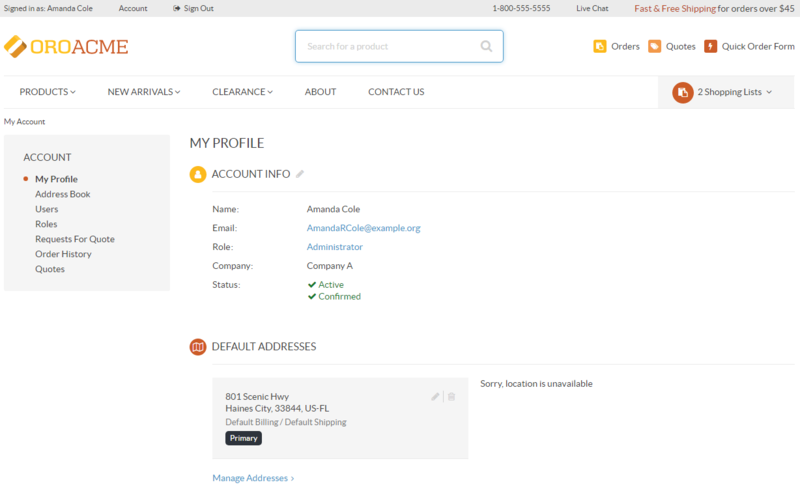 To manage default addresses in the address book, click Manage Addresses on the bottom of the section. You can also open the address book by clicking Address Book in the menu on the left. To comply with the General Data Protection Regulations in the EU (GDPR), you need to be to provide your explicit consent to the application to process your personal data. All available consents are located in your profile under Account Info. Mandatory consents restrict you from proceeding to the checkout or creating RFQs, unless you accept them. Mandatory consents are marked with a red asterisk. Optional consents do not restrict you from working with the application and are usually used to retrieve permissions to send them email newsletters, inform about upcoming sales or seasonal discounts, etc. 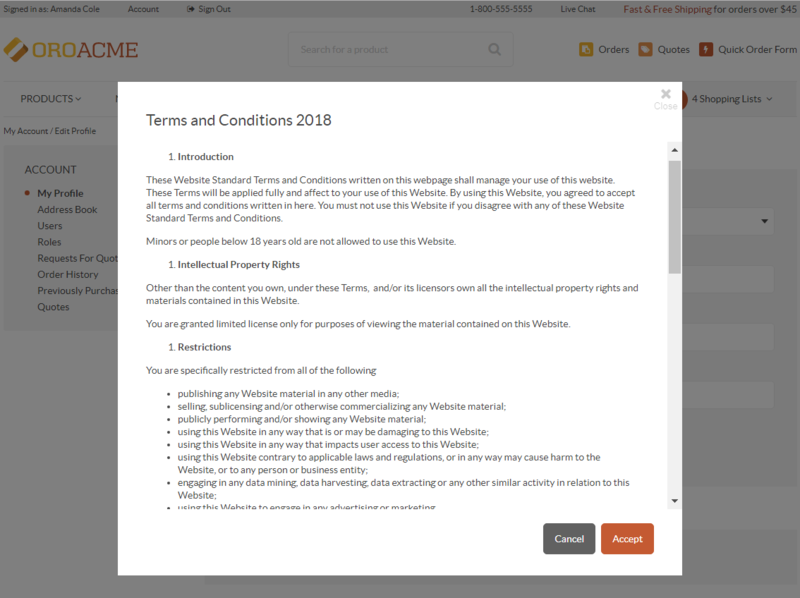 The check boxes next to consents are never pre-selected and you can opt in only by explicitly clicking Accept under the consent. You can be aware of how exactly your data is going to be processed and shared, and what marketing communications you can expect once you provide your consent. Therefore, you can view all your accepted and pending consents (and their detailed description) in your profile under Account > My Profile > Account Info in the storefront. If you are no longer happy with a consent, you can revoke it through your profile in the storefront when editing your Account Info. Click Edit next to the Account Info section. You can view the description of the available consents in the Account Info by clicking on the consent links. The icon indicates that the consent has not been accepted, while the indicated that it has been read, understood and accepted. 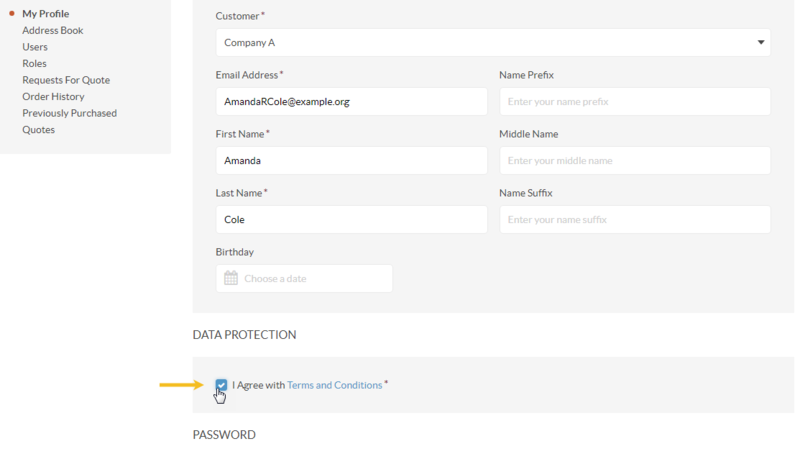 In the Data Protection section, select the check box next to the consent that you want to accept. At this point you are prompted to read the text of the consent. Click Accept to agree to the terms of the consent. Click Save on the bottom left. 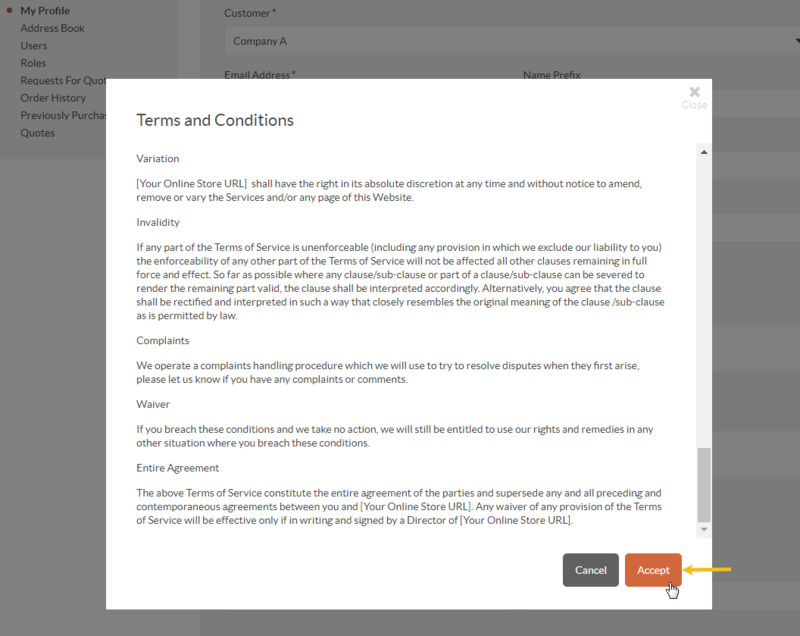 You can view the description of the available consents in the Account Info section by clicking on the consent links. The icon indicates that the consent has not been accepted, while the indicated that it has been read, understood and accepted. 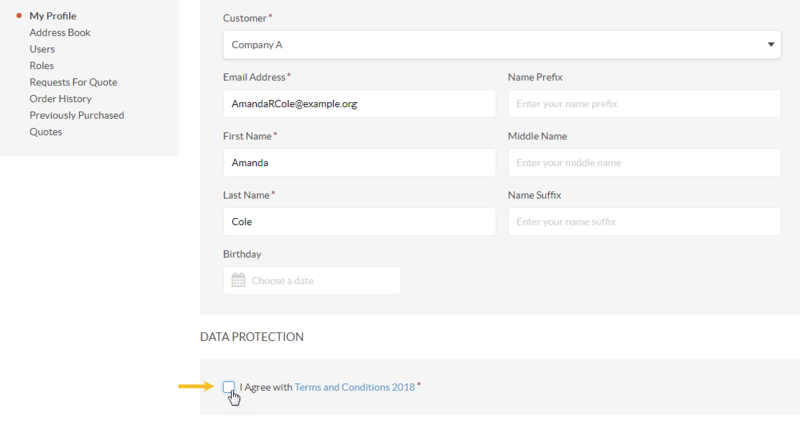 In the Data Protection section, clear the check box next to the consent that you want to revoke. Click Save on the bottom left of the page. Confirm that you wish to decline the consent by clicking Yes, Save. You will be automatically redirected to the page of your profile.